Wow! My first read of Toni Morrison, and it did not disappoint. It was powerful and weighted–normally I’d brace myself for a read like this before jumping in. So, ignorance is bliss, and I jumped, committing to finishing the book in three days. Subjects addressed in The Bluest Eye…race, class, and economics, within the black community and the same juxtaposed outside it. Morrison lyrically framed an irony in our existential experience. We’ve tried co-opting it by owning insults originally designed to demean us in order to remove the sting that was their intent, only to stumble upon them like children running with scissors. This is apparent in the phrases heard when I was younger, the ones my mother endearingly used with the caveat, “I’m just preparing you for what you’re bound to hear”, the phrases teenagers use too casually these days, and the phrases Morrison’s characters use as a natural part of their setting. However, Morrison has artfully taken this along with self-sabotaging notions we often take for granted and scrutinized their deleterious effect. She’s revealed the sinister destruction we can wield on ourselves and she does this through the main character of Pecola, whom she paints in a hostile setting rife with dysfunction. I would deem this book required reading in any American Social Studies class because of the vivid picture it paints of how we are still overcoming outside influences we internalized generations ago. This said, it should also be a book the well-read must experience because the subjects within it are universally relevant. 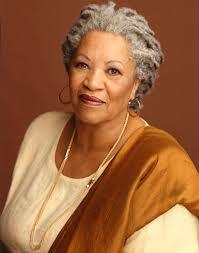 This is my favorite Toni Morrison book! I haven’t read it yet either but I hear it is classic Morrison where you have to abandon everything and really get into it. I had a very hard time understanding this book. But after reading this review I feel like give it another go. The race relations and social ills Toni Morrison addresses, although set in the U.S., are not exclusive to the U.S. African-American experience. Her writing is a catalyst for discussions about race within our own community too; like why do we still use the “N” word among ourselves or speak of good hair and bad hair, or other relics imposed on our cultural dialog. It’s a conversation opener. Morrison’s works open conversation. So, give it another go and report back. I read it, Kennedy – on your suggestion! 🙂 (You had reminded me about it on my blog a while back.) And… I absolutely loveddddd it!!!! I am humbled by the fact that you read “The Bluest Eye” on my recommendation, because that makes everything I love about reading and sharing literature worthwhile. An immense thank you! You probably noticed that my blog is in its fledgling stages and I am trying to grow readership, so again, your “follow” and making the experience interactive is invaluable. Another immense thank you! I am Darell Philip on goodreads. Please add me so that I can add you too and we can all share in the readings! Oh yes, her writing is marvelously textured. I just finished her latest book, God Help the Child. I’ll post the review soon. When I taught English at the college level, I used to assign this book as part of a survey American Lit course. My (predominantly white and wealthy) students complained that it should be removed from the reading list because it was “too depressing.” I refused to remove it. It is TOO depressing. And only too real. And that’s why it should continue to be assigned and read. Our society still faces life and death matters, extreme policing, economic disparity, and other social ills; remnants of stuff that happened before us, too depressing and complicated to discuss—or is it? This is why Morrison’s book, The Bluest Eye, is frustratingly relevant and a discussion imperative; so, I’m glad you used it as such in your classroom. Turning a blind eye to systems that promulgate “the bluest eye” as referenced in Morrison’s book, leaves us dealing today with issues rooted in the past. I hope for students to have the benefit of more teachers like you with an understanding of what literature does for dialog and dialog can do for change. I read this book at a young age and was taken in by its themes of racial and cultural politics. Along with Alice Walker’s “The Color Purple” and Maya Angelou’s “I know Why the Caged Bird Sings,” this ranks as one of the best in literature from an African-American perspective. Definitely one of the all time great books from my childhood that I feel the need to revisit owing to this great review which has reminded me of my reading past!